It is with great sadness that I report that Dr. Martin Reiser who served as the Editor-in-Chief of the Performance Evaluation journal from 1987 till 1990, died of cancer on July 25, 2017 in a hospital in Zurich. He is survived by his wife Verena and his sister Julia. Martin was born on May 15, 1943 in Zurich, and received a diploma in electrical engineering in 1967 from the Swiss Federal Institute of Technology (ETH). He joined the IBM Zurich Research Laboratory, where he conducted his doctoral research in large-scale numerical simulations of Field-Effect Transistors (FETs). He received his Ph.D. degree from ETH in 1971. In 1972 Martin moved to the IBM T. J. Watson Research Center, Yorktown Heights, N.Y. on a two-year assignment from the Zurich Lab, joined my group “System Measurement and Modeling,” and our productive collaboration began. He was new to the field of computer performance modeling, but quickly learned random processes and queueing theory on the job, so to speak. We started publishing a series of technical reports within a year. Perhaps one of the most referenced articles on performance modeling is our joint paper on computational algorithms for a queueing network . Our convolutional algorithm generalized Jeff Buzen’s algorithm developed for a network of exponential servers, to a general product-form network with multiple classes of customers and general Markovian routing. Martin was also a superb programmer, well versed in PL/1 and APL. He developed a software package, QNET4, which implemented the above computational algorithm, with a textual interface for the user to specify the topology and routing chains of a queuing network and associated parameters. It was widely used by IBM’s product development division for IBM System/370 at Poughkeepsie, NY and elsewhere. He then developed, with Charles Sauer and Ed MacNair, a more general package named RESQ (RESearch Queue analyzer) which included simulation modeling component in addition to the queueing theoretic model implemented in QNET4. Both QNET4 and RESQ were valuable tools to disseminate the state-of-the-art modeling methodology to the research and development community at large, and their success triggered worldwide development of modeling software packages at AT&T Bell Labs, INRIA, NEC and other industrial labs and many universities throughout the world during the late 1970s, 1980s and beyond. After a short assignment to the IBM San Jose Research Lab, he rejoined the IBM Research Center at Yorktown Heights in 1974 and became Manager of the Performance Evaluation group within my department “Systems Analysis and Algorithms.” Martin had superb presentation skills, and was capable of explaining complex systems effectively and eloquently, using well-prepared diagrams and drawings. He was also an excellent artist. In 1976 Martin was appointed Manager of a newly created group “Distributed Systems Studies,” and investigated the routing and flow-control protocols for IBM’s SNA (Systems Network Architecture). In order to speed up his simulation model of the SNA, he applied a queueing network to its high-level abstraction model. But the aforementioned convolution algorithm was not fast enough because the number of operations required was on the order of O(WR), where W is the window size for flow control and R is the number of virtual routes. With only R=20, and W=10, an astronomical number of computation steps of O(1020 ) would be needed. This impossible situation behooved Martin to come up with an innovative idea, which led to what is now known as the “Mean-Value Analysis (MVA)” [2-5]. By the time Martin conceived the basic idea of MVA in the summer of 1977, the late Steve Lavenberg (March 23, 1945-August 15, 2016) had moved from IBM San Jose Lab to my Department and had become Manager of the Performance Modeling Methodology group. Being an excellent mathematician, Steve gave a rigorous mathematical footing to the MVA , by first proving what is known as the “Arrival theorem” for a product-form network. We should note that independently of the Lavenberg-Reiser work that appeared in J. Applied Prob. in 1980, the late Kenneth Sevcik (May 7, 1944-Oct, 4, 2005) of Univ. of Toronto and Isi Mitrani (Newcastle upon Tyne) published the arrival theorem in Journal of ACM in 1981. In 1979, Martin returned to the IBM Zurich Lab as Manager of the “Communications and Computer Science Department.” Under his leadership, the IBM Token-Ring was developed. In 1986-1990, Reiser was the Director of the IBM Zurich Research Lab, where about 200 scientists worked in the area of physics, device technology as well as computer networks. Martin was very proud of the fact that during his tenure as the Director, IBM Zurich Research Lab won the Nobel prizes in Physics for two years in row, i.e., in 1986, Gerd Binning and Heinrich Rohrer for their work on scanning tunneling microscope, and in 1987, Georg Bednorz and Alex Müller for their discovery of high-temperature superconductivity. In 1990-1991, after stepping down from the IBM Zurich Lab Director position, Martin became a visiting professor of ETH, where he collaborated with Prof. Niklaus Wirth, who is well known for developing programming languages such as Pascal and Modula. Martin worked with Wirth on an object-oriented language “Oberon” . In 1991-1994, Martin served on the IBM Corporate Technical Committee, working for the office of Chief Scientist and Director of Research. In 1997, Martin Reiser joined GMD, the German National Research Center for Information Technology. Dr. Dennis Tsichritzis, the then president of GMD, recalls “Martin came as an accomplished scientist and research manager to GMD, and was instrumental in setting up a new Research Institute for Media Communications (IMK) and became its first Director. Under his leadership IMK produced many innovative results, especially on augmented reality, which were all pioneering work. I got to know and respect Martin a great deal, and I am truly sad that he passed away at an age when he could still contribute.” This position at IMK gave Martin an opportunity to realize his dream of bringing together information technology and arts. The virtual reality production of Beethoven’s opera Fidelio, created by IMK, is now on display in the Beethoven-Hauss Bonn (http://www.beethoven-haus-bonn.de/sixcms/detail.php?id=39119&template=&_mid=39119). In 2000, GMD merged with the Fraunhofer-Gesellschaft, Germany’s leading organization for applied research. Reiser became Director of the Fraunhofer Institute Media Communications. Martin’s last public speech was an invited lecture entitled “What is Color” delivered at the 2016 IEEE International Conference on Ubi-Media Computing (U-MEDIA 2016) held in Moscow on August 15-17, 2016 (http://2016.umediaconf.com/invited_talk_Martin.html). Among the numerous honors and recognitions he received are: the Silver Medal from ETH for the doctoral thesis (1971), Five IBM Outstanding Innovation Awards (1975-83), IEEE Fellow (1987), IFIP Silver Core (1989), IEEE Koji Kobayashi Award (with Steve Lavenberg, 1991), Election to the IBM Academy of Technology (1993), Honorary Professor of Informatics at the University Cologne (1998), Member of the Swiss Academy of Engineering, and Honorary doctoral degree from the Technical University of Moscow (2016). Martin was an avid photographer. His website is full of beautiful photos of the sceneries and people he shot in Myanmar, Singapore, and elsewhere (http:// r-e-i-s-e-r.de) . In May 2001, Martin, Ulrich Herzog (Univ. Erlangen-Nürnberg), Pieter Kritzinger (Univ. Cape Town) and myself, accompanied by our spouses, took a safari tour to Botswana after attending the conference “Africon 2001,” organized by Pieter. I vividly remember that Martin was carrying two expensive cameras, several lenses and a tripod. Unfortunately, none of the photos taken at Botswana are posted in the above website. The last time I and many of our professional colleagues met Martin was at the IFIP WG7.3 workshop organized by Christoph Lindemann (Univ. of Leipzig) on May 16, 2007, honoring his birthday and retirement from the Fraunhofer Institute. The workshop was held at Schloss Birlinghove located on the campus of the Institute in Sankt Augustin, close to Bonn, Germany. Paul Kühn (Stuttgart), Satish Tripathi (Maryland), Mary Vernon (Wisconsin-Madison) and I (Princeton) gave invited talks. 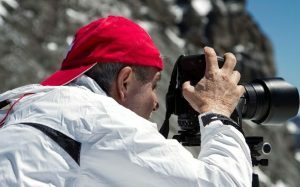 It is very sad that Martin could not fulfill his plan to visit his friends or pursue his great passion for photography. It was a great privilege to have been a friend and colleague of Martin. May his soul rest in peace. M. Reiser and H. Kobayashi, “Queueing Networks with Several Closed Subchains: Theory and Computational Algorithms,” IBM Journal of Research and Development, 19 (3), 283-194, May 1975. M. Reiser, “A Queueing Network Analysis of Computer Communication Networks with Window Flow Control,” IEEE Trans. On Communications, COM-27 (8), 1199-1209, August 1979. M. Reiser, “Mean Value Analysis: A Personal Account,” in Lecture Notes in Computer Science 1769: Performance Evaluation: Origins and Directions (G. Haring, C. Lindemann and M. Reiser (Eds. ), Springer), 491-504, 2000. M. Reiser, and S. S. Lavenberg, “Mean-Value Analysis of Closed Multichain Queueing Networks,” J. ACM, 27 (2), 313-322, April 1980. M. Reiser, “Mean-Value Analysis and Convolution Method for Queue-Dependent Servers in Closed Queueing Networks,” Performance Evaluation, 1 (1), 7-18, January 1981. M. Reiser and N. Wirth, Programming in Oberon, Steps beyond Pascal and Modula, Addison Wesley/ACM Press (1992). Monday, September 11th, 201711:37 amThis entry was posted on at and is filed under Uncategorized. You can follow any responses to this entry through the RSS 2.0 feed. You can leave a response, or trackback from your own site.